Here is crash course for COOLSIS to jump start. COOLSIS is a software created to help teachers organize their work in the most efficient way possible. The development team at COOLSIS has crafted the software to be user-friendly and less time consuming by eliminating unnecessary information within the program. Also the design of the program is flexible to the needs of the user; the layout and background can be adjusted for every individual user. COOLSIS incorporates several essential software modules like grading, attendance, discipline, document server, human resources management, parent/student access, and more. Also general reporting and advanced data analyzing tools merged right in to COOLSIS data source to materialize input-data to human discretion with elegant charts and dazzling graphs. By using COOLSIS any teacher can create complex reports very efficiently. a) Check your personal information form the profile menu at the top right corner of the COOLSIS toolbar, make sure to keep this information up to date. b) You may create help tips to ask questions, leave comments and share your valuable ideas through our fully integrated Helpdesk application. You may also find extra training documents, how to videos, and user guides within this system. c) Don’t forget to Logout from COOLSIS before closing your browser. And note that your session is going to expire after some time and COOLSIS is going to ask you to login again to access your account. You may see icons only related to your role on shortcut menu. Main menu is located on the left side of the COOLSIS screen with easy to use drop-down options. It contains links to COOLSIS modules and submenu of the current module. There are several core and optional modules available in current version of the COOLSIS and please remember that your COOLSIS will show you only the modules you need. The toolbar has some similar members for each module, the most common ones as below. In addition to these options you may also see more specific icons on your toolbar. 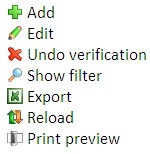 Each option is easy to guess from its icon and the option name next to it and you can also see a quick tip next to your mouse cursor when you keep your cursor on any icon for a second. Any other detailed information about other members of the toolbar is not in the scope of this document. If you need more detailed information please refer to COOLSIS help.